Erratic is an installation project that intentionally combines the level of control attainable in digital design and fabrication with unwieldy materials that behave erratically when constrained. Its spheroid, floating massing and agitated surface echoes an erratic block that has been tumbled by glacier-ice. Because erratic blocks have been transported, they differ from their surrounding context and are typically eccentric in appearance. The fuzzy surface of Erratic will be point wise attached to an armature. Forcing a larger sack of a thick and semi-rigid material onto a smaller structure produces a deep relief of meandering, swirling furrows. The excess material gathered by this move makes the surface bend and furl in an unpredictable manner, as if its surface was experiencing sudden bursts of noise. 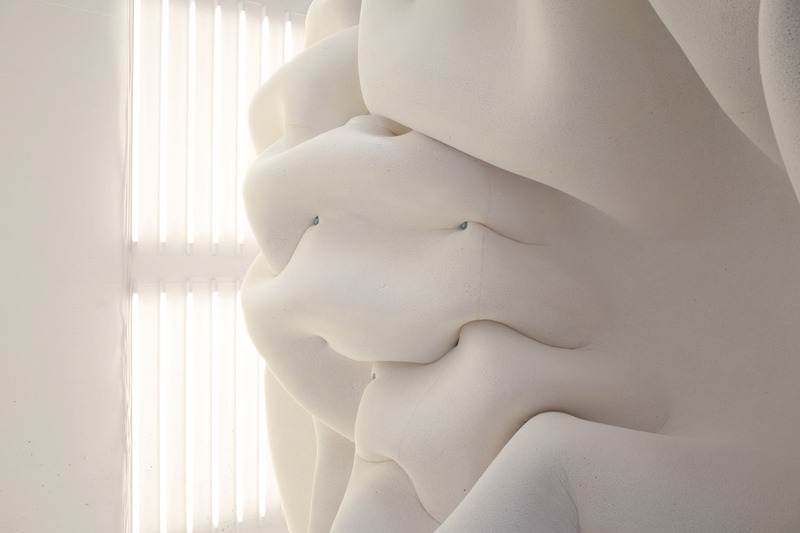 By intermingling analogue material studies with fabric simulation done in animation software, Erratic investigates and extends the current boundaries of matter, materiality and digital geometry in contemporary architectural design. Erratic is designed to have direct sensory appeal, but it simultaneously seeks to incorporate a wider set of less immediate experiences. Ranging from its massing to its materiality, it evokes a multitude of ambiguous associations that address our perception of nature. It may look as if it was shaped by natural forces, but is at the same time clearly designed and manmade. Its soft surface alludes to patterns of crevices normally found on rocks, but is also reminiscent of a turbulent fluid medium. Daniel Norell is a licentiate fellow in architectural technology at the KTH Royal Institute of Technology in Stockholm, a senior lecturer in architecture at Chalmers University in Gothenburg and co-founder of architecture studio Norell/Rodhe. He received an MArch.II degree from University of California Los Angeles (UCLA), where he studied on a Fulbright scholarship, and an MArch degree from the KTH. He has previously worked as a designer in the offices of Greg Lynn FORM in Los Angeles, Zaha Hadid Architects in London and Kjellander & Sjöberg in Stockholm. Einar Rodhe is a lecturer in architecture at the KTH Royal Institute of Technology in Stockholm and co-founder of architecture studio Norell/Rodhe. He studied architecture at the Royal Academy of Fine Arts in Copenhagen and at the KTH in Stockholm, where he received an MArch degree with distinction. He has previously worked as a designer in the offices of Ghilardi + Hellsten in Oslo as well as Guise and Wilhelmson Arkitekter in Stockholm. Erratic - The Material Simulacra of Pliable Surfaces. Norell, D.; and Rodhe, E. In Thompson, Emine Mine (ed. ), Fusion - Proceedings of the 32nd eCAADe Conference - Volume 2, Department of Architecture and Built Environment, Faculty of Engineering and Environment, Newcastle upon Tyne, England, UK, 10-12 September 2014, volume s. 145-152. Thompson, Emine Mine (ed. ), Fusion - Proceedings of the 32nd eCAADe Conference - Volume 2, Department of Architecture and Built Environment, Faculty of Engineering and Environment, Newcastle upon Tyne, England, UK, 10-12 September 2014, 2014. Erratic. Norell, D.; and Rodhe, E. 2013. 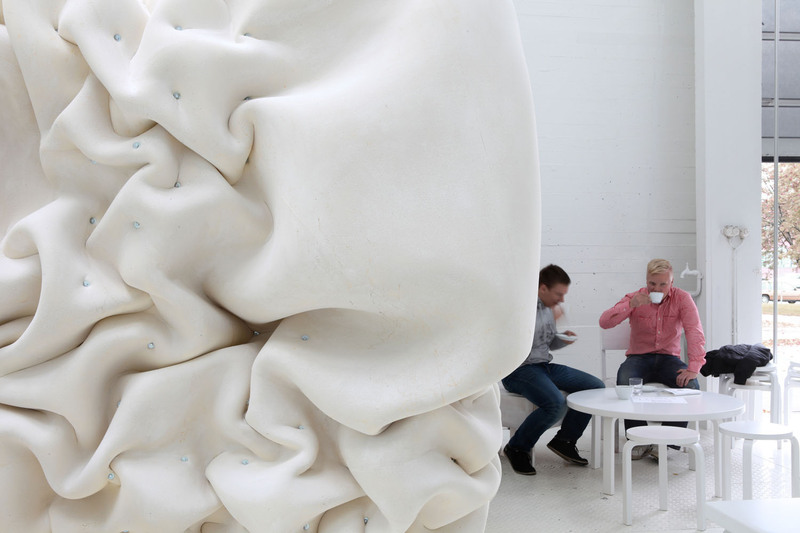 ADDLAB: Aalto University Digital Design Laboratory, Helsinki, Finland.